Mehmet’s belly got in the way of quality time with his son. He tried excessive cardio, but it was weight training that transformed him into a bodybuilder. 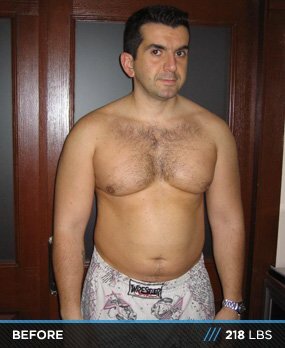 See how he lost 35 pounds! I used to be into sports throughout high school (you should know it's very difficult to find supplements in Turkey), but after I graduated from the dental faculty as a dentist, I got into normal life. I tried to make money and build my family business, the same story as we ordinary people have. After several years I returned back to university to get my Ph.D. in endodontics (dentistry) which took me 6 years. In that time I had a son, and by the time he was 3-years old, I had a BIG belly. One morning when I couldn't bend over and tie my son's shoes, I realized I must do something for myself. Since then I've competed 2 consecutive years in various local bodybuilding shows in Ankara, Turkey. I was the 2-time Ankara champ in Classic Bodybuilding Over 180 cm, and 5th place two times at Turkey's National Championship again in the Classic Bodybuilding Over 180 cm class. He's your friendly neighborhood dentist, but when Mehmet isn't ripping your teeth out, he's crushing it in the weight room. In the first 3 months after starting my training, I tried lots of cardio to burn fat but I couldn't get good results, my muscles didn't seem pumped or bigger. In September I was in New Jersey at my sister's for a month and I trained at Gold's Gym at Totowa. It was there that I realized how I needed to change my routine to get the results I was after. After I returned to Turkey I talked about the problem with my dear friend and teacher Rifki Karatas (former national bodybuilder of Turkey). After this talk, I started a hard weight-training program without cardio, taking my supplements daily on a strict schedule along with a great meal plan. To help with dieting, I found a restaurant around my hospital where I can eat lean and smart. In Turkey it's nearly impossible to find diet food anywhere. The Republic of Turkey connects Asia, Europe and the Middle East. Men like Mehmet hold the continents together. Dietary fat is important for good health and optimal (anabolic!) hormone levels. A little goes a long way, though, since fat is a very concentrated source of calories. Because of this, you should limit your fat intake to 0.3g per pound of bodyweight, with the bulk of it coming from natural, whole food sources and small amounts of unrefined and/or supplemental oils. I used a 3-day rotation in my workouts. I had 3 workouts, but since I train 4 days weekly, I start again at Workout 1 on the 4th day, and continue rotating through this sequence, picking up at the next workout the following week and so forth. For every body part, I warm up with a light set of 25 reps for the first exercise. As I mentioned above, when I done training I hate to still be in the gym for cardio. Yes, maybe my body would be better that way, but I never feel like that. I don't like to stay at the gym for more than an hour because I have a family, a son I love to spend time with. Also, doing cardio makes me so tired and small as I saw in the past, so when I think I need some heart work I change the number of reps of squat and deadlifts. I do 25-30 reps with the same number of sets, but the weight I use goes about 50-or-60 percent lighter. Change begins TODAY. Change your mental outlook, engaging in "possibility thinking." Change your body. Be sure you do everything basic and simple, if you push yourself so hard to do everything rigidly, you won't be able to continue at the same pace long. Keep meals and workouts simple but steady. Whatever you do, don't worry about failing. If you aren't failing then you aren't really living. Look, the most successful people in the world are also the ones who have failed the most. Why? Because they're always taking action.